Hello... Hello ... my old friends ... It's great to see you once again! When keyboardist and vocalist Julian Crook bounded onto the stage for his debut gig with Bev Bevan, Trevor Burton and The Move [in place of a busy Neil Lockwood] at the Brewood Music Festival back in July, I was indeed impressed with his versatility and performance. 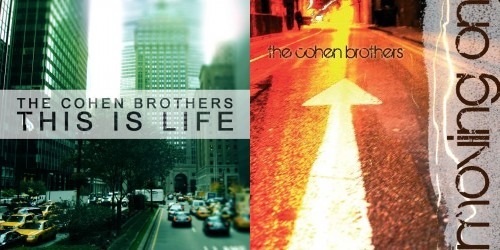 Hence it was only natural to touch base with Julian and investigate his own ongoing musical project The Cohen Brothers too! And that I did on the night of Friday 7th September at the fantastic Queen's Head in cosy Wolverley when Yours Truly KJS travelled the 20 odd miles south to catch the band in concert. The Cohen Brothers - who are Julian Crook [Keyboards/Vocals], David Smaylen [Drums], Peter Cottom [Percussion/Effects], Sean Griffin [Guitars/Harmonica] and Brian Richards [Bass] - produced a performance par excellence at a packed venue in front of an enthusiastic and appreciative audience which included fellow Move member Phil Tree and Trevor Burton Band bassist Pez Connor. This five  piece outfit - strongly influenced by Steve Winwood, Jimi Hendrix, Eric Clapton and Santana - delivered two  sets of their own compositions intertwined with classics including the likes of "Little Wing", "This Is Life" [the title track from their latest album], "Can't Find My Way Home", "Moving On"' "Black Magic Woman", "Memphis Without Elvis", "Do It Right" and "Gimme Some Lovin'" [naturally!] - amongst not a few others. ELO Beatles Forever [ELOBF] recommends The Cohen Brothers to those enlightened folks who also like ELO, Jeff Lynne, Roy Wood, 'Brum Beat', The Idle Race, The Move, The Beatles and related artistes.